I almost was a lawyer. I was an actor, and like most actors, I didn’t act much, and did other jobs. Some of my friends were waiters or drove cabs. I was a private eye. I worked for an investigation bureau that serviced negligence lawyers, the type that advertised on TV. I drove around New York City signing up accident victims, and photographing their broken arms and legs, as well as the scenes of their accidents, usually cracks in the sidewalk that had tripped them. I got ten bucks an hour and thirty cents a mile. The attorney got a third of the settlement. Having had math in college, it didn’t take me that long to figure out the lawyer was doing better. So I studied up, took the LSAT, and scored well enough to attract attention from colleges. I was considering where to apply when my agent called to say he’d sold my first book. That was the private eye novel Detective, that would later go on to be nominated for the Edgar and Shamus awards. While I was thrilled, PI books were actually not my first love. I grew up on Erle Stanley Gardner. My parents were both English lit teachers, and after a hard day of slogging through the classics, they would rush home, put their feet up, and whip out the latest Perry Mason murder mystery. As a ten-year-old child I was intrigued by this phenomenon, so I read one. It was fantastic. Since then I have read all of them, many times. When Gardner died it was like a personal blow. 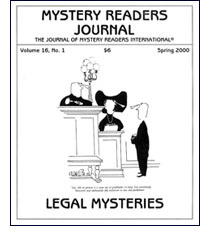 In 1973 I began writing a Perry Mason book, and applied to Gardner’s widow for permission to use the characters. She refused, saying no one but her husband could ever write Perry Mason. Unfortunately, by the time she got back to me I was already 150 pages into The Case of the Anonymous Client, but I complied with her wishes, set the manuscript aside, and did not think of it again. Until I got published. Then it occurred to me I could finish the book. But not as a Perry Mason, since I still couldn’t use the characters. And it couldn’t be the first book in a series, since the plot required that the lawyer be an established character when the book began. But I had a screenplay called The Baxter Trust about a young hippie lawyer named Steve Winslow, left over from my screen writing days. I wrote that up as a novel, got a two book deal, and the second book in the series, The Anonymous Client, was the Perry Mason book I’d started 15 years before. It came out in 1989 (under the pen name J.P. Hailey) and sat on the shelf in Barnes and Noble right next to The Case of Too Many Murders, a Perry Mason mystery by Thomas Chastain, published with the consent of Gardner’s widow. I was devastated by the news, but delighted by the comparison. Gardner was a lawyer, so his books are pretty accurate. After my first Steve Winslow, The Baxter Trust, I watched a murder trial before completing The Anonymous Client. The case was pretty spectacular. It was a quadruple homicide. The defendant, Larry Davis, was charged with killing four drug dealers. He had been captured after shooting it out with twenty-seven cops. He was defended by William Kunstler. After three months of watching the trial, the only change I made in my second book was I would sometimes have the lawyers argue objections at the sidebar instead of in front of the jury. That’s the closest I ever got to court. And it’s probably just as well. In the long run, I’m sure I’m better off writing about it than doing it. I almost was a lawyer. Parnell Hall has a website at www.ParnellHall.com. Why do we—and here I mean both readers and authors—seem to have such a fascination with the sub-genre of crime novels now known as “Legal Thrillers?” While most of my published fiction has involved John Francis Cuddy, a private investigator in Boston, many of the thirteen books and forty short stories in that series have dealt with issues confronting the justice system, such as reporters’ confidential sources (Yesterday’s News), the right to assisted suicide a la Dr. Kevorkian (Right To Die), and revenge killings of male divorce attorneys by disgruntled husband/opponents (The Only Good Lawyer). Also, in July, 1998, a legal thriller of my own entitled The Stalking of Sheilah Quinn focused on the “John-Grisham-meets-Elmore-Leonard” problem of a female criminal defense attorney being targeted by the very murder defendant she gets out on bail. Accordingly, this sub-genre has been on my mind for a while, and I have some thoughts about the reasons for its popularity. First, I think we baby-boomers have contributed substantially to this phenomenon. All of us remember vividly Raymond Burr on television as Erle Stanley Gardner’s Perry Mason. In addition, major legal cases dominated the news at significant points in our lives: the Army-McCarthy hearings in the fifties, the Manson Family trials in the sixties, and the Watergate proceedings in the seventies. All of these, I believe, whetted our appetites for the “renaissance” begun with Scott Turow’s Presumed Innocent in 1987 and continued ever since by John Grisham, Jay Brandon, Lia Matera, William Bernhardt, Perri O’Shaughnessy, Paul Levine, Lisa Scottoline, Philip Margolin, Barbara Parker, and Steve Martini. Also, I think people who aren’t themselves lawyers are fascinated both by how the law works–and perhaps more importantly, by how it doesn’t work–in specific areas of human relations. In effect, the author of a legal thriller is explaining the courtroom to the reader just as the writer of a medical thriller explains the operating room, with any professional jargon first identified, so the reader can vicariously experience the sense of being a litigator or a surgeon without having to plow through a textbook on Criminal Procedure or Human Anatomy. Of course, as a “recovering” lawyer myself, I have to concede one possible, if cynical, reason for the popularity of legal thrillers: Given that there are a million attorneys currently alive in this country, and that many of them are unhappy practicing law, courtroom novels are simply being bought up in huge numbers by frustrated lawyers wanting to learn the “trick” of becoming successful novelists. Good reading to all, and thanks to Janet Rudolph for offering this opportunity to express my views. Jeremiah Healy is the author of the John Francis Cuddy mystery series.